SSG975 Single Folding Security Gate, Galvanized Folding Gates,Riverside Paper Co.
Our Galvanized Steel Folding Gates are the strongest and the most secure gates you can buy. Folding gates provide security during the day as well as ventilation and visibility for dock doors, hallways and entrance ways. Our folding gates are the only security gates made with solid galvanized steel 5/8" and self-securing drop pins designed to fit directly into floor holes. 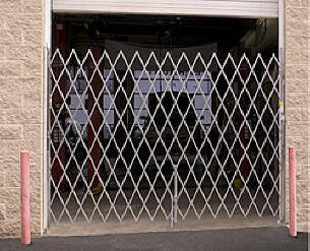 They provide the most strength and security of any folding gate on the market. For maximum security, a 48” Locking Bar that can be wall mounted is included with all Galvanized Steel Single Security Gates. You can also order steel folding security gates in special colors and rust-proofing. Call for quote. Expanding Gates can be installed onto existing window frames and door frames. Single folding gates lock on the left side unless otherwise specified when ordering. Locks not included. Installation is a snap for your maintenance crew, hardware and instructions are provided with each galvanized folding security gate. Optional: Free standing posts may be ordered for mounting Single Gates without a wall or casing. FOB factory. Allow 6-8 days for delivery.